Physically, for me, 2012 was where it all went wrong. I wish now that I had known when I was in my prime because I would have enjoyed it a whole lot more at the time. Anyway, teeth, knees, back, lungs, head, body, innards – last year it was all collapsing. Of course, I didn’t go to the doctor, I did what anybody else in 2012 would do and consulted Doctor Google who frightened the bejeezus out of me. One good thing is that I still managed my yearly goal of 150 gym sessions, though now that we’re on to the 5th year of this it’s become less of a goal and simply a thing that I do. This year I miscounted and accidentally did session 150 on Christmas Eve, and so could take the rest of the year off, which turned out to be a good thing because I then developed a cracking lurgy which resulted in me hiding under a blanket for quite some time. So I enter 2013 feeling a bit lumpen and under par, but not intending to keep it like that. Whilst I do do a lot of things unsuccessfully, you can’t fault my capacity for having a go. 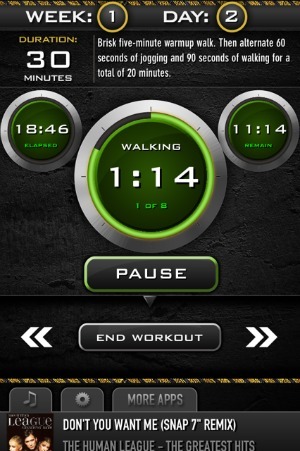 And this week I downloaded the C25K app. This is the latest incarnation of the Couch to 5K beginner’s running program, which aims to take you from lounging peacefully on the sofa eating crisps (lovely) to pelting about like the zombies are after you (nightmare). For the first session, my knees protested, as did my left hip. The next day I woke up at 5am with griping calf pain. My legs really don’t like this running business at all. Hard cheese hombres, I’ve started now, and one way or another we’ll finish. The program works by starting you off very gently – repeated sessions of a minute’s running plus double that in walking to recover. Having done Couch to 5K before I know it’s got a sting in its tail – at about week 5, when you’ve progressed to gentle lolloping like a happy spring bunny, it wallops you with something ridiculous like an 8 minute run. 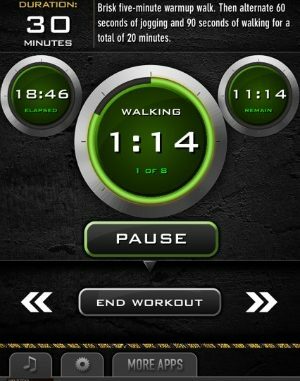 The app works by interrupting whatever music you’re listening to and telling you to start walking or running or whatever. Only, it doesn’t do it quite loud enough for my cauliflower ears and I keep missing the cues. This has led to, on occasion, an accidental extra 30 seconds of running. Honestly, the things I put myself through. It’s no wonder I’m collapsing. So my plan now is to keep up with C25K (or Y2K as I keep calling it in my head) for as long as I can until either the gym classes empty enough for me to get back in, or my legs crumble, or I get sick of listening to the Human League’s Greatest Hits. Well, you’ve got to have a plan haven’t you? Wish me luck.